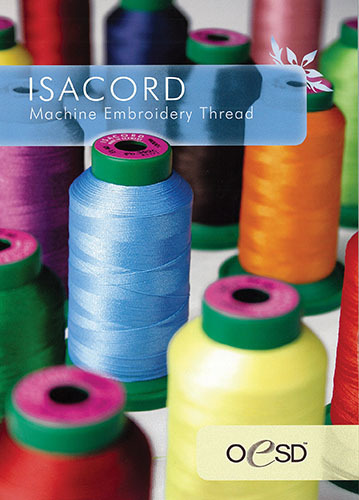 Isacord Thread is the thread used by the largest embroidery companies. Isacord Polyester Machine Embroidery Thread is extremely reliable and works well in any machine. Isacord Thread comes in a wide ranging selection of colors. Smooth, reliable, resists puckering and looping. The 40wt Polyester Embroidery Thread is nearly twice as strong as Rayon thread. Due to popular demand 5000m Cones Are Back! - please allow one extra day for all cone orders. Specifically designed for today's high speed industrial embroidery machines. Yenmet metallic thread has abeen developed to run similar to regular embroidery threads at high production speeds without breaking, tangling, or shredding. Unique construction consisting of a nylon core wrapped in a silve exterior which is dyed and then coated with a polyester film provides an incredibly smooth finish and vibrant color sheen. Within the Yenmet line are: Twilight, a special metallic thread and Pearlessence, a thread with a mother of pearl look. A beautiful multi colored 40wt polyester embroidery thread made of the same materials as their solid colored embroidery thread.